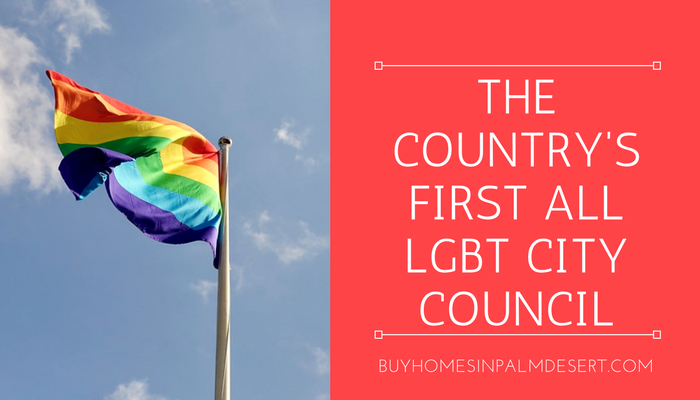 This week, December 10, the country's first all LGBT city Council was sworn in in Palm Springs. This history-making counsel's newest members, Lisa Middleton, was the first transgender person elected to a nonjudicial office in California. Christy Holstege was also sworn in and identifies as bisexual. These two women replace Ginny Foat and Chris Mills, who announced earlier this year they would not seek reelection. These two new councilmembers won last month's election receiving just over 30% of the vote for both. Lisa Middleton is a former senior vice president of internal affairs for the State Compensation Insurance Fund. She's a former member of ONE PS chairwoman, the Palm Springs Planning Commissioner, a board member for the Desert Horticulture Society of the Coachella Valley, as well as Equality California, Neighborhoods USA, and LGBT Community Center of the Desert. These two women join Mayor Robert Moon, Lisbon with his partner for 35 years as well as Councilman Geoff Kors, who has been in the Palm Springs Unified School Board member, and Councilman JR Roberts who also identifies as a gay man.